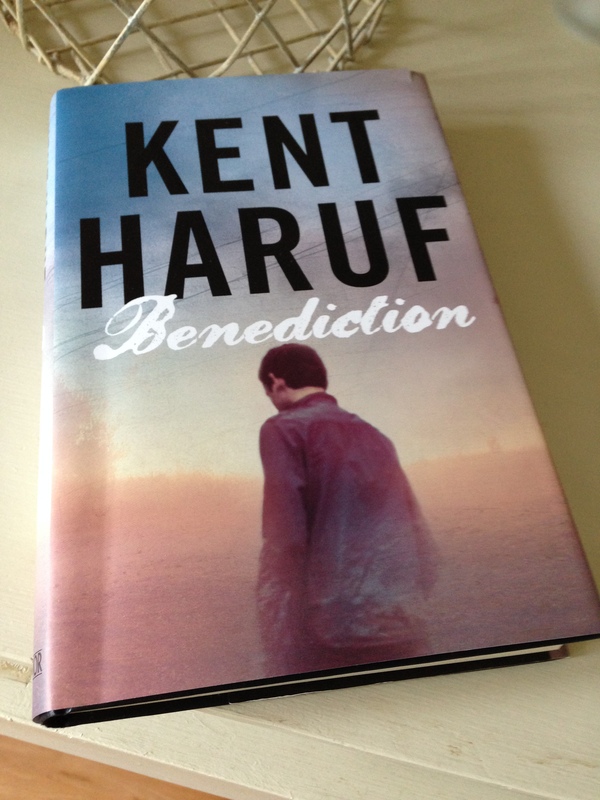 Benediction is the third book in Kent Haruf’s Plainsong trilogy, a series of novels set in the fictional town of Holt, Colorado. I read the first two (Plainsong and Eventide) a year or so ago, but they have been widely reviewed elsewhere. Each novel can be read independently but what unites them is a strong sense of place and community. The central character in Benediction is Dad Lewis, owner of the local hardware store for more than fifty years. An honest, reliable, plain-speaking man, Dad is old and dying of cancer. As close friends and workmates come to say their farewells, Dad’s loving wife, Mary, and daughter, Lorraine, try to ease the pain of his final weeks at home. As Dad’s story opens up, we learn a little more about his earlier years. Dad is a proud, upstanding man with traditional values; he is somewhat stubborn too, and like most of us he has regrets in life. As he faces his own mortality, it becomes increasingly clear that Dad is haunted by the ghosts of his past. Dad and Mary’s estranged son, Frank, casts the darkest shadow over their lives. Reflections on the years gone by reveal Frank’s homosexuality, a discovery that proves too difficult for Dad to come to terms with at the time. By contrast, Mary appears more willing to accept the situation in the slender hope of maintaining a relationship with her son. There are times when Dad and Mary visit Frank in Denver once he leaves home as a teenager, but the atmosphere is strained to say the least. The following conversation between Mary and Dad gives a feel for the lie of the land – they have just left Frank’s apartment, and the first voice we hear is Mary’s. I am upset. I’m disappointed that we don’t have anything to do with him. Anything more than this. Than what happened back there. You give me money to give him and I put it in an envelope for Christmas and he hasn’t even thought to have anything to give us in return. We see him working at the café and we follow him up to his dirty little apartment room in a dirty old house and we drink tea and we talk for five minutes, then you go outside to warm up the car and that’s it. I wanted it to be nice. I told you that. Something present there between us and our son. We’re going to lose him, she said. Don’t you know that? We lost him a long time ago. Mary still lives in hope of reconciliation with her son especially as the end draws near for Dad. Alongside Dad and Mary’s narrative, Haruf touches on the lives of other people connected to this couple. We meet Alice, an eight-year-old girl who has recently come to live with her grandmother in the house next door to Dad and Mary’s. Feeling lost and a little bewildered following the death of her mother from breast cancer, Alice welcomes the friendship of Lorraine (Dad and Mary’s daughter). The young girl is also befriended by kindly mother and daughter, Willa and Alene Johnson, friends of the Lewis family. In a touching scene from the book, the women take Alice on a picnic, and they all bathe together in a nearby stock tank. Haruf is especially good when it comes to portraying the lives of these women, their values and principles, their hopes and disappointments. There is a final strand to the story, that of the town preacher, Lyle, and his family who have recently moved to Holt following a transfer from Denver. Lyle’s character is perhaps more lightly sketched and less convincing than others in the novel. That said, Lyle is clearly struggling to reconcile his own ideals with the prejudices he encounters amongst some of Holt’s more conservative residents. Benediction is a novel that captures the pain and loss experienced by people in their everyday lives, a quiet, contemplative story of ordinary, plain-speaking folk. It’s hard to pinpoint exactly what makes Haruf’s books so special, but he brings a profound sense of compassion and humanity to everything he writes. Haruf’s prose is spare and unshowy, but there is a beauty in its simplicity. His characters feel authentic, their values and failings are clearly portrayed through their thoughts and actions. Small acts of kindness and affection speak volumes. This is a melancholy, elegiac novel, almost unbearably moving at times especially as Dad’s life draws to a close. Haruf doesn’t hold back on the mental and physical suffering associated with a slow death, but this is balanced by the deep sense of empathy shown by Dad’s family and friends. Plainsong remains my favourite of the trilogy, but Benediction is a fitting end to the series. I’ll finish with one last quote, a passage from Dad’s final weeks. They helped him move out to the front porch and stood watching the rain falling on the grass and out in the graveled street. There were already puddles in the low places and the silver poplar trees were dark, streaming with water. Lorraine held her hand out to the rain and patted her face and then cupped both hands and caught the overflow from the gutters and held her hands up to Dad’s face. He stood leaning on his cane, his face dripping. They watched him, he looked straight out across the lawn past the wrought iron fence, past the wet street to the lot beyond, thinking about something. Doesn’t it smell good, Mary said. Benediction is published in the UK by Picador. Source: I won this book in a giveaway – my thanks to Kim at Reading Matters and Picador. This entry was posted in Book Reviews, Haruf Kent and tagged Book Review, Fiction, Kent Haruf, Picador, US on July 26, 2015 by JacquiWine. Ashamed to say I’ve never read him yet, but think I’d like him. I’m a bit rubbish with American authors (well, contemporary ones at any rate) – not sure why. I don’t tend to read very many contemporary American authors either, although I would like to plug a few gaps by reading a few modern/20th-century classics. Novels by the likes of Richard Yates, William Maxwell and John O’Hara, that type of thing. Plainsong would be a good novel for you to try if you wanted to read Kent Haruf. I think you’d like him – he’s a very compassionate, humane writer. ‘I wanted it to be nice. I told you that. Something present there between us and our son. We’re going to lose him, she said. Don’t you know that? Thanks, Poppy. You’d like him very much, I think. He’s one of those rare writers that brings a combination of compassion, sensitivity and intelligence to his work without it ever feeling mawkish. Yes, that quote haunted me too, it’s so sad. You have captured this book beautifully. Thanks for bringing it all back to me. Thank you! That’s good to hear – glad you liked it too. I’ve only read his very last book before he died. But this sounds like a great read and I would love to give the trilogy a try! I recall your review of Our Souls at Night, Melissa, and it’s on my list for the future (probably when the paperback comes out). I think you’ll enjoy the Plainsong trilogy, and if anything, the first two novels are even better than Benediction. In my opinion one reason that we read fiction is to get inside of folks that we otherwise would have so much difficulty understanding. The main character in this book is someone who would puzzle me and frustrate me to no end in real life. Yet I think that it is extremely valuable that authors explore these various kinds of thinking and view with understanding and thoughtfulness. I believe that this is beneficial on so many levels. Thanks, Brian. Yes, I’m with you on your first point, that’s very true. Also, I think you’ve hit the nail on the head with your comment on the value of exploring these issues with understanding and thoughtfulness. Haruf writes with a rare combination of sensitivity, compassion and humility. The novel does shed some light on the lead character’s personality, his values and beliefs; and while I would never condone Dad’s behaviour towards his son, I did come away with an insight into what lay behind the rift. I’ve not read the first two but having experienced Benediction I do want to go back to the beginning. You captured the essence of this novel so well. I loved that scene too where the women go swimming. Thank you. It’s a great scene, isn’t it? Almost as if you’re observing a private ritual unfold before your eyes, and so beautifully handled too. If you liked Benediction, then there’s a strong chance you’ll love Plainsong and Eventide – I think they’re even better than the final novel in the series. Nice review, Jacqui. Kent Haruf is one of those names I keep hearing but have never bothered to explore, so it’s good to know something more about his work. Sounds as though Plainsong is the place to start – but when I’d ever get to it, I have no idea! Thanks, Scott. It’s funny, I only discovered Haruf a couple of years ago around the time when Benediction came out in hardback! He seems to have slipped under the radar somewhat, although his final novel, Our Souls at Night, has generated a fair bit of interest over here. If, and only if, you ever want to try him then Plainsong would be the one to consider – I think it’s the best of the trilogy. I agree with Brian’s comment: I’d probably have trouble with Dad in real life but it’s interesting to read about different views on life. I’d probably like Plainsong too. thanks for the review, I’d never heard of Kent Haruf. Yes, I know what you mean. Dad is very traditional and stuck in his ways when it comes to family values and sexual relationships. It’s sad to think about it, but I suspect this scenario is not unusual in small-town communities, not just in the US but over here in Europe too. Plainsong is excellent. In fact, I think it would have made my end-of-year highlights had I been blogging back in 2013. I’ve not read him either, but the great reviews of his final book make me want to start with this trilogy. He sounds like a wonderful writer. I’ve heard nothing but great things about Our Souls at Night, too. It sounds gentle, thoughtful and intelligent, just the type of novel I would expect from this writer. You’d like Haruf’s work, Claire, I’m pretty sure of it. He brings so much compassion and humanity to these stories of small-town folk. Start with Plainsong as it’s an excellent introduction to his style and themes, and you’ll probably find yourself hooked on another trilogy! I was going to say that this sounds rather melancholy but then you used that very word in the review. Is this book sadder than the other two? Melancholy is the word, definitely. Benediction is sadder than the first two in the series, especially as we know from the outset that the lead character is in the final stages of his life. I’m not sure whether you’d like this one, Guy, as the closing chapters of the novel home in on Dad’s final days. It’s very moving, beautifully written, but I recall you saying some time ago that you tend to steer clear of books where the shadow of death looms large. The first two novels in the series — Plainsong and Eventide — are excellent, and could be read independently of Benediction. (None of the characters carry through to the final novel.) As I was saying to Emma, Plainsong would have made my 2013 end-of-year list had I been blogging back then. If you wanted to try him, then Plainsong is the one that might suit you best. Yes I would say not for me. Benediction that is. Haruf is one of the many writers I still haven’t read, but mean to. I have Plainsong on my shelf all ready for the big day. I don’t think I’ve ever heard anything negative about his books. Oh, I think you’ve got a treat in store with Plainsong – I loved it! I’m sure you’ll like it, Naomi – it’s right up your street. I’m a little sad now that I’ve reached the end of the series. Still, Our Souls at Night has had great reviews, one to look out for in the future. I read Our Souls at Night not too long ago, and it was a wonderful book that made me want to read his trilogy. A lot of what you say about Benediction would also apply to Our Souls; they are quietly moving stories and very atmospheric books. I think you captured that feeling well in your review. I’m looking forward to reading him again. Thank you, TJ. I recall your review of Our Souls at Night, and it made me even more determined to get to it at some stage (probably once the paperback comes out as I tend to prefer them over h/bs). It’s good to know that you got a very similar vibe from Our Souls. He’s a very compassionate writer, I think. Quietly moving is a good description; there’s something very gentle about his style despite the hard-hitting nature of some of the situations he portrays. I think you’ll enjoy the trilogy very much, something to look forward to. Not a writer I’ve ever read or thought of reading (as you say, he seems to slipped under the radar a little) but I’ve recently heard a lot of praise. It does sound like Plainsong would be the place to start. I don’t know if you’d like him, Grant. It’s hard to tell as his novels are quite different from much of the translated lit you enjoy reading. I do think he’s very fine writer, though. Melancholy and elegiac are qualities I love in novels but what really appeals to me is that last quote. So beautiful. I’d be tempted to read this novel first, just be able to immerse myself in that world but maybe it’s better to start with Plainsong. It’s a lovely quote, isn’t it? So moving (and a good illustration of Haruf’s style). As I was marking it up, I already had it in my mind for the end of the review. Alternatively, kick off with Plainsong, which is my favourite of the three – Plainsong definitely needs to be read before Eventide, though, as there’s a clink link between the two. I really hope you get a chance to give him a try, he’s quite a writer. Very welcome. I doubt you’ll be disappointed by his novels, Caroline. Plainsong would have made my ‘best of the year’ list had I been blogging a couple of years ago. As for the book-buying ban, good thinking on the gift idea! I found a book voucher I hadn’t used yet! Your comments and replies have helped me appreciate many more qualities of the book and to acceptance of the melancholy here after just finishing the book. Thank you, I’m glad you found them useful. It’s a great trilogy, full of compassion and humanity.